I have to admit, as much as I enjoy cooking for my other half, family and friends, I am way too lazy to cook for myself alone. With the dearest being away for the WE and after having spend the day outdoors, I inevitably find myself hungry at dinnertime and no desire whatsoever going out again or ordering any kind of heavy takeout. A trip to the fridge revealed a very sad looking avocado, tiny leftover of barrel aged feta and a pack of runner beans (1 day past their best before date) which I am not sure why we bought in the first place. So I start throwing things together. Avocado with feta leftovers (I have no more than 1 tbsp) and drizzle with some lemon juice. In the meantime blanch the runner beans in salted boiling water for 3-4 mins. Taste them – booooring. But then I notice how perfectly their colour would match the avocado-feta mix… So I cool them down under cold running water, drain well and simply throw them together. Another taste – mmm… interesting, but something is still missing. At that point I know if I am to add another ingredient it will have to match the colour scheme. 🙂 Another trip to the fridge and there is pesto! I adore pesto and could eat a whole jar in one sitting if it wasn’t for so many kcal! So there go 3-4 teaspoon blobs of pesto onto the mix, pinch of salt and pepper and a good mix through. I have to say, even though the result looks everything but pretty, it is surprisingly tasty. The runner beans add the much needed crunch to the creaminess of avocado and give the “dish” a well balanced texture. 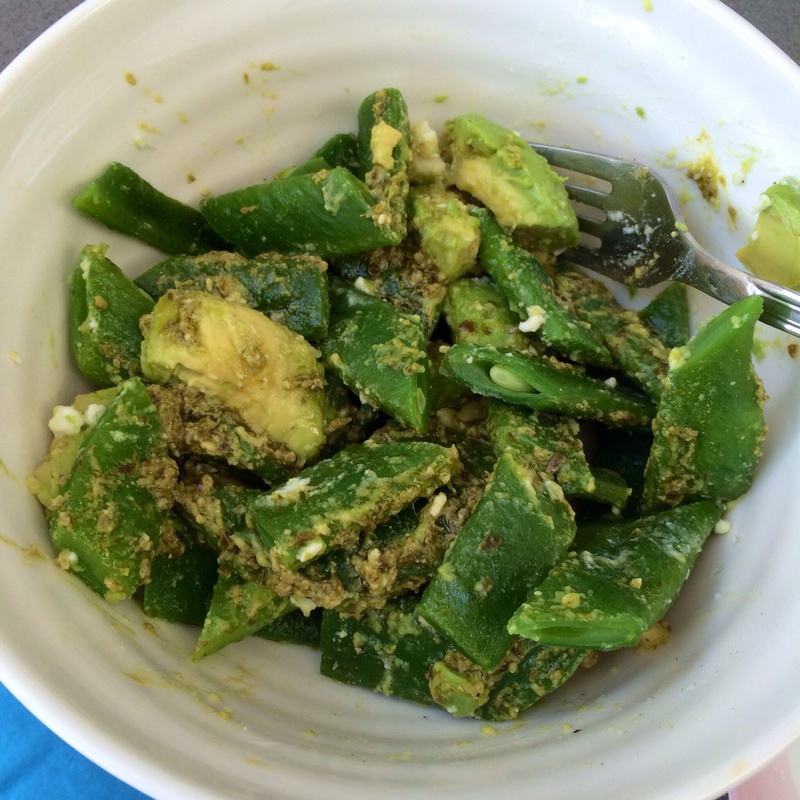 Neutral tasting beans and avocado gain nice flavours through feta and pesto. I enjoyed it so much I thought the “dish” deserved being called a salad and given a name – Sweervy’s Green Mess. Wine pairing: even though I didn’t have any wine with it, I imagine a dry crisp white being a nice accompaniment, e.g. a mineral Chablis or a vibrant Sauvignon Blanc from NZ.